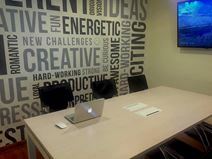 Office Space - Vina Del Mar, . Located in the heart of the locally renowned and commercially significant Vina del Mar commercial district, this luxurious and contemporary office space provider is available on an "All in" basis that includes an extensive range of services and amenities including high speed internet connections, high quality furniture, 24/7 use and the use of spacious and technically equipped meeting rooms. All in the heart of Viña del Mar.